Yuya Uchida is a full-on Rock'n'Roller! In 1950's, he idolized Elvis Presley, and decided to play Rock'n'Roll. He quit high school, and organized his first band called the "Blue Caps". 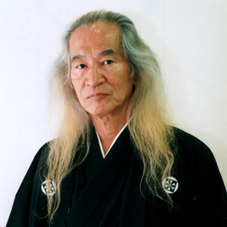 In 1959, he made his debut at the Nichigeki Western Carnival. In 1966, when the Beatles came to Japan, Yuya was one of the opening performers for their show. In 1967, he went to Europe, and was immediately inspired by Cream, Jimi Hendrix and the Who. After he came back to Japan, he formed a new band named "Flowers", with vocalist Remi Aso. This band caused a sensation in the Japanese music scene. In 1970, he created "Flower Travel'n Band", featuring vocalist Joe Yamanaka. "Flower Travel'n Band" debuted in Canada and their album made it into the best 10 in the Canadian music chart. In 1973, he started an annual New Year countdown concert called "New Year Rock Festival" which continues today. In 1975, he made a LP record with the Ventures entitled "Hollywood, Yuya Meets The Ventures"
In that year, he produced a big concert, titled "World Rock Festival". He was both a musician and producer. As a producer on the Japanese music scene, he dreamed that all musicians would perform on one stage. At the "World Rock Festival", his dream came true. Jeff Beck, Felix Pappalardi and the New York Dolls played with Japanese musicians. In 1976, he starred in the movie "Furenzoku Satsujin Jiken". After this, he appeared in many films. In 1978, he released his original album entitled "A Dog Runs". In 1982, he released his second album entitled "Farewell My Lovely" which was the concept album of the world of Raymond Chandler. In that year, he played the leading part in the movie entitled "A pool without water", which he also produced. In 1983, he played the leading part in the movie "A mosquito in the 10th floor" which he also produced and wrote the script for. In 1985, he played the leading part in the movie entitled "No more comics!" (he also produced the film and wrote the screenplay). This movie was selected for showing at the Director's Fortnight of Cannes International Film Festival. It won "the Best Film Award" at the Houchi Film Awards. Yuya received "the Best Actor in a Leading Role" at the Houchi Film Awards, "the Best Script Award" of the Mainichi Film Concours and "the Best Actor in a Leading Role" of the Cinema Jumpo Awards. In 1988, he appeared on the stage of "Molotov cocktail" directed by Yukio Ninagawa in Aoyama Spiral Hall. In 1989, he appeared in the movie "Black Rain" directed by Ridley Scott. In 1991, he ran for Governor of Tokyo. Though he didn't really want the title, he ran in order to make a political statement that anyone could run for government. He didn't win, but he did receive 54,654 votes. In 1992, he produced, wrote the script and acted in the two movies entitled, "Dioxin from fish" and "Les Liaisons Erotiques". In 1998, he starred in the movie "Kyohansha". In 2002, the 30th anniversary of the New Year Rock Festival took place. In 2003, he played the lead role in the movie "AKAME 48 waterfalls". In 2004, he appeared on the stage of "Abortage" directed by Kansai Yamamoto in Budokan. He is still Rock'n'Roll now! Copyright © 2008 UchidaYuya.com international All Rights Reserved.